In San Diego we have an active 160 Meter group, 1.945 MHz, nightly, around 7 to 8 PM. Also, our RACES Room at the County EOC has 160 Meter capabilities. Since Valor went under I don't know of anyone who makes a 160 Meter "hamstick" style of antenna so, I made one. 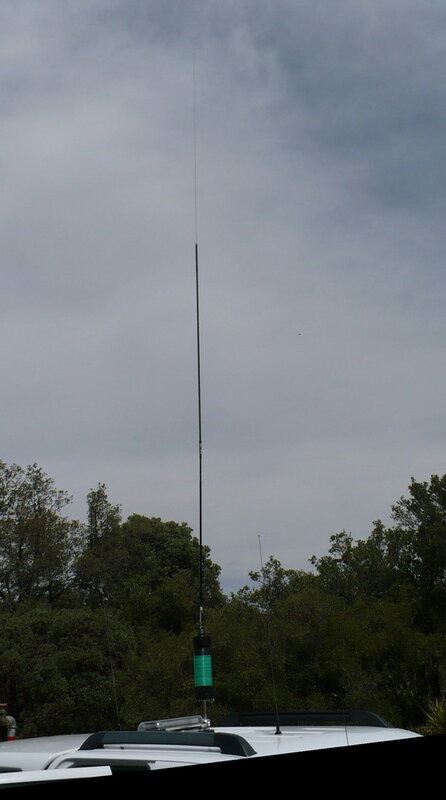 I had tried stacking 2 75M "hamsticks" but only got down to around 2.5 MHz. Looked like time to build a coil. UPDATE 2/2019 - I found a 160M whip in England at Nevada Radio. Being lazy I never calculate anything. With the MFJ-269 meter my motto is build, test, cut, test. 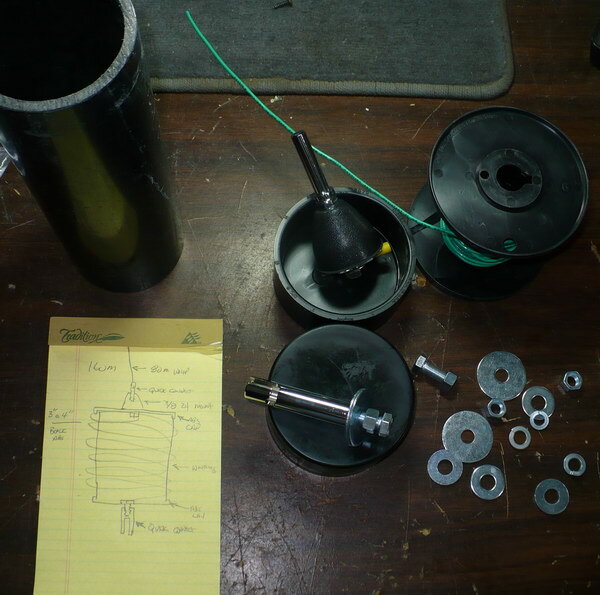 Looking up 160M mobile coils on the Internet most people talked about big diameter coils about 8" long. Center load is best but with the weight of my design I chose base load. Above the parts. Left to right. The plan. A 12" length of 3 1/2 OD, ABS sewer pipe. Caps for the top and bottom. Top cap will have a 3/8 24 mount out of the junkbox. The bottom mount is a 3/8 24 bolt and fender washers. You will notice quick disconnect adapters on each end. All my mobile antennas are equipped with them. I tried some expensive, brand name quick connects and found them very wobbly. I now use great, cheep. Opek KD quick connects from cheapham.com. Wire, #14 solid house wire and finally, assorted washers. Here is the final length potted. Like my 4/1 balms I use Elixir Plas-T-Cote, RV rubber roof coat. Available at most RV supply stores. And finally, I got lucky and found some 4" shrink tubing at the local surplus store and now I have a big yellow coil. 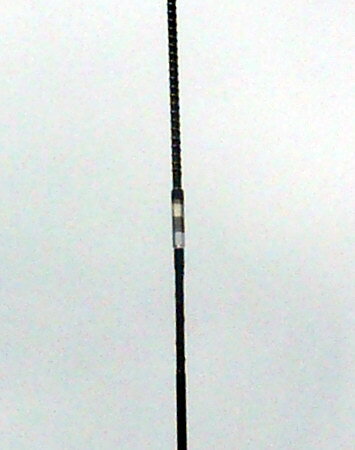 Here is the overall antenna, before the potting, during the tuning phase. So, what's above the coil? First is a MFJ-2375T "short" 75 Meter antenna. I purchased this and their 40 Meter version as they are shorter than the Hamstick and have a little less wind resistance. When it arrived I found a bonus. The 75M version has a 3/8 24 female at the top. The tuning tip has a 3/8 24 adapter with a normal tuning tip and set screw. 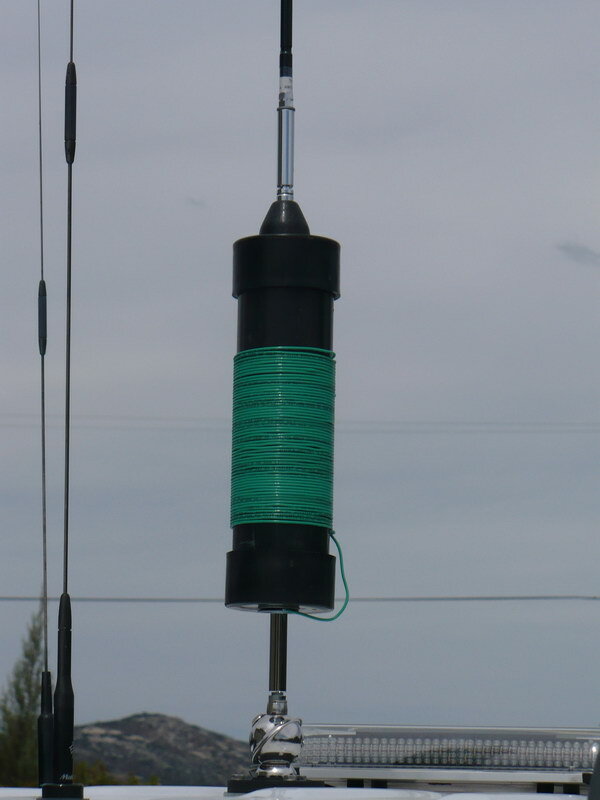 The bonus is, without the tip, I can screw another antenna in the top of the 75 Meter and make a longer whip. Turns out for this project an old CB 11 Meter "hamstick" style antenna with a little longer tuning tip makes the whole thing resonate at 160 Meters! In the smaller close-up above you can see where they are screwed together. Not shown in the close-up is a large shoulder washer that I can put in the junction of the 2 antennas. With 2 holes drilled in the ring I can attach cord to make a guy point. Even though I would never go down the road with this rig its nice to have the option to guy it with the Santa Winds we have in Southern California. I think great. The MFJ shows a Rs feed point impedance of 42 Ohms, and an Xs of around 4 at a tuned VSWR of under 1.5 to 1. This was a surprise as the Rs of my 75 and 40 Meter sticks are usually around the expected 20 or so Ohms. I can work from around 1.93 to 1.945, under VSWR 2.1, without re-tuning. I didn't make San Diego on my first try but did manage to put in an S9 to Barstow!